I often hold up my knitting and say things like, "ooh, it's almost a sock for the dog!" Very pretty flowers. And they do look like hydrangeas! Better not leave them though, ones we have in the garden, you plant a blue one and turn your back for 5 minutes and the flowers go pink! Looks like time for a break. Cake anyone? That was how I approached my Masters. I ended up with a Graduate Certificate. They are beautiful Liesl. If there is no "due date" then just enjoy the making. 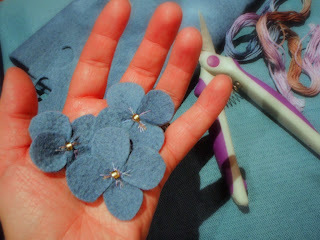 When you've absolutely had enough and you can't make one more bloody blue felt hydrangea, then the number of flowers will tell you'll know what you've made! Quite. Familiarising myself right now with emergency exits for yo-yo project... half-inch-hex project... 2-inch-hex project... japanese kaleidoscope project... and so forth! In theory, I'm all for the long haul, the meditative hand-sewing, the vision and commitment. In practice, I want it made yesterday in 3 seconds. They look lovely, I can't wait to see what you do with them! Looks awesome so far Liesl - and only 77 to go!! !